In a context as polarized as today, in which the strengthening of neo-nationalisms of a fascist nature and the intensification of the extractive brutality of the neoliberal regime in the region, coincide with a growing socialization of decolonial and anti-racist theories, it is vital to rethink and question the representation of “Latin America” in the field of art history. Look Who’s Talking gathers the reflections of artists, curators and researchers who, recognizing that we are all traversed and affected by these forces, are betting to ask: to what extent have we subverted the colonial gaze? What does a decolonization located in Latin America mean for our global, continental and regional collective imaginaries? And no less important, from where do we speak as Latin American curators, artists, and cultural agents? Terremoto is a communication platform dedicated to contemporary art in and around Mexico City and the American continent with a specific focus on the South: from the border states of MX and USA to Central & South America and the Caribbean. 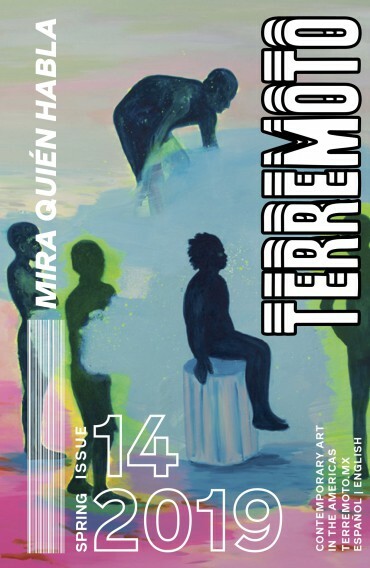 Since December 2015, Terremoto also exists in its printed version, with a distribution of 6000 copies in more than 250 venues in the Americas and beyond. Our printed magazine is published 3 times a year, each one with an specific theme that offers a transversal point of view on current practices, actors, and problematics of the region through critical thinking. Every week, original contributions in English and Spanish featuring the voices and ideas of the most cutting edge art professionals of the Americas are posted for free online.